At the beginning of winter quarter, the shuttle stops on 33rd Street for the Dragon and Powelton/Spring Garden routes were switched. An email was sent to Drexel University students and faculty Jan. 4 notifying them about the change. However, as a daily rider of the Powelton/Spring Garden shuttle, I think this is an unusual decision. This is a temporary change, according to the Dragon shuttle schedule, but nothing has been said as to when the stops will return to their normal locations. The Dragon route has stayed the same, aside from the change in starting location. The Powelton/Spring Garden route was slightly changed by adding a few stops, but I don’t think that is what would have warranted this switch. Now, instead of turning onto Baring Street from 33rd and then turning right onto 35th Street, the bus continues straight, turning left onto Haverford Avenue, left onto 36th Street and then right onto Powelton Avenue. However, the bus can hardly make the tight turn onto Powelton Avenue. Cars on the other side of the street always have to move over to allow the bus through. A couple of times, the bus driver has gone off the route because of the difficult turn. This is a change to the route that I don’t see necessary, especially since I never noticed a problem like this with the previous route. Now, the hundreds of students who take the Dragon shuttle every day have to wait outside of the Papadakis Integrated Science Building on 33rd Street between Market and Chestnut streets. The crowd of students waiting typically clogs up the sidewalk; this happens most at times around noon and 5 p.m. when most people seem to be using the shuttle. Not nearly as many students regularly take the Powelton/Spring Garden shuttle, and the sidewalk never got congested at its original stop. The stop on 33rd and Market streets is more appropriate for the Dragon shuttle crowd as it has a designated area where some students can sit or stand away from the flow of foot traffic. The only issue is when a line of students is loading the bus since the entire sidewalk gets blocked, which creates a major obstruction and a huge annoyance. 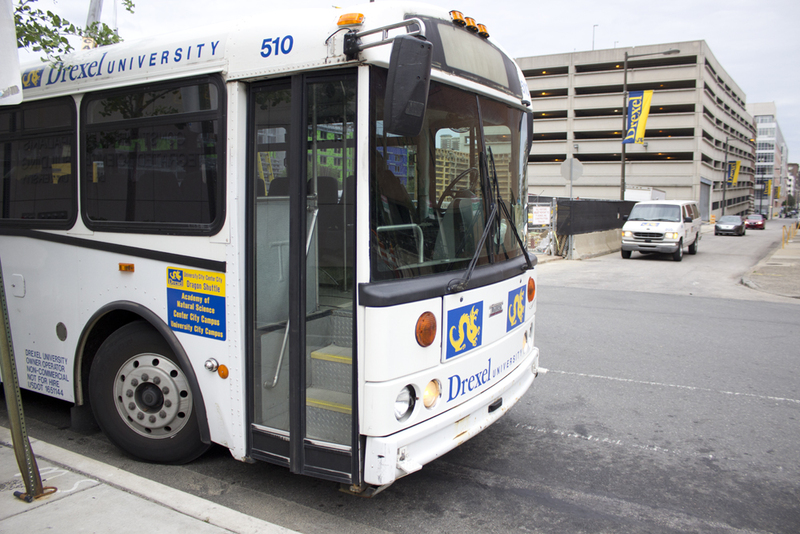 Although a small issue in the grand scheme of things, Drexel should consider switching the Dragon and Powelton/Spring Garden stops back as soon as possible to better accommodate the respective riders of each shuttle.